From teamwork to awards season! Front row, from left, are staffers Jasmine Santalla, Maria Ramos, Rachael Westbrook, and Jackson Thompson; back row, from left, Tim O'Boyle, Chelsey Johnstone, Drew Mumich, and Griffin Jones. 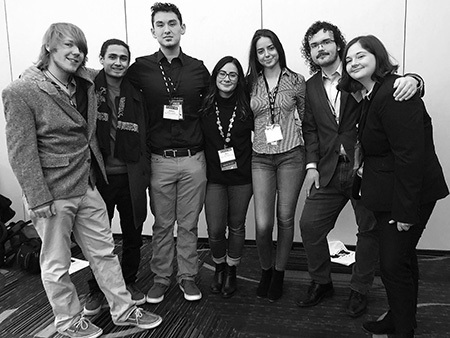 At the College Media Association convention in New York City in March are, from left, Drew Mumich, Mohammad Wiswall, Jackson Thompson, Maria Ramos, Lia Viteri, Griffin Jones, and Chelsey Johnstone. (Not pictured: Mike LaFisca, Rachael Westbrook, Sean O'Connor, and Laurie Gallagher. Mercer's student reporters were honored at the college's April Board Meeting. From left are Board Chair Carol Golden, reporters Griffin Jones and Maria Ramos, co-advisors Holly-Katharine Johnson and Matt Kochis, and President Jianping Wang. West Windsor, N.J. – Anyone looking for proof that hard works pays off need simply take a look at Mercer County Community College’s (MCCC’s) student newspaper, The College VOICE. In addition to the ace reporting, compelling photography, provocative opinion pieces, and solid research that have become hallmarks of the paper, as of late, Mercer’s student reporters have been busy collecting awards for their work during the 2017-18 academic year. Breaking all previous awards garnered by The VOICE in a single year, the grand total is 24 awards, 17 from the New Jersey Collegiate Press Association (NJCPA), including the coveted General Excellence top honor – and seven from the Society of Professional Journalists (SPJ) Region 1. According to English and Journalism Professor Holly Johnson, The VOICE’s co-advisor with Matt Kochis, the students have achieved this high standard through dedication. “The students are amazingly talented and hard working. Most of them are carrying a full course load, working 35 hours per week or more at jobs, and writing for the newspaper.” Johnson said. She also emphasized that the diversity of the staff has contributed to their success. “This year the editor-in-chief is from Mexico, the sports editor is Korean American, there are LGBT students, a Mormon student, Honors students and a DREAM student. They mentor and support one another, bounce ideas off each other, motivate one another. It’s an amazing team.” Johnson says. Ramos and Jones represented the staff at the SPJ ceremony, which was held in the Philadelphia Inquirer building on April 21. They took a tour of the building and of historic journalism sights in Philly. They even got a look at one of the country’s first printing presses. The VOICE also scored big in the New Jersey Collegiate Press Association (NJCPA) awards competition, with 17 awards that were announced at the New Jersey Press Association’s gala on April 14. Johnson notes that The College VOICE is an awards contender every year. “But to put this year’s accomplishments in perspective, consider that these students won more than twice as many awards as last year. And that was a good year, too,” she said. 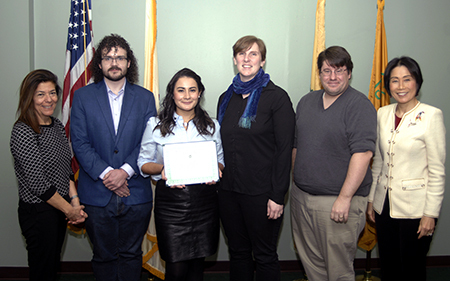 Mercer students won NJCPA awards in every major category: newswriting, features writing, column writing, biography and profile reporting, investigative reporting, sports reporting, arts and entertainment writing, photography, and website design. The 24 awards were spread among nine students. “With this year’s 24 awards, The College VOICE maintains its reputation as one of the most widely recognized and top ranked two-year college newspapers in the nation,” Johnson said. Dr. Wang recognized The VOICE during the college’s April Board of Trustees meeting. Students received a certificate of honor for The VOICE given by Dr. Wang and Board Chair Carol Golden, other board members, and administrators. NJCPA awards included first place to Jones (photography) and Jackson Thompson (features writing); second place to Ramos and Thompson (news article); second place to Ramos (feature writing); second place to Jasmine Santalla (biography/ profile);second place to Mike LaFisca (column/opinion writing; second place to Thompson (sports writing); second place to Ramos and Tim O'Boyle (investigative reporting); second place to Santalla (photography) and second place to the staff for The VOICE website mcccvoice.org. 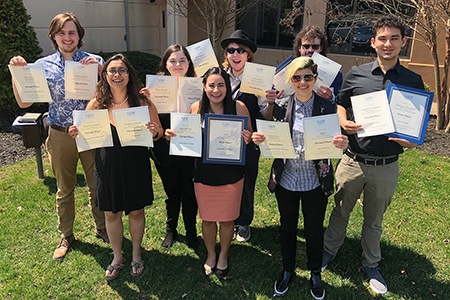 Third place awards went to Jones (feature writing) and (biography/ profile); Chelsey Johnstone (editorial writing); Ramos (column/opinion writing); Thompson and Drew Mumich (arts & entertainment review); and Ramos and Jones (investigative reporting). “Twenty-four awards is pretty good considering we started this year with only four students," Johnson said. "We expect to have just six returning in the fall after almost half the current team graduates. But they are not daunted. I know their goal for next year is 25,” Johnson says.